Last week, some friends and I with our noodle brains went to fill our noodle stomachs at Sapporo in midtown. We came in from the cold-winded, coldhearted outsides to the steamy ramen fumes. Two of us got the "special" ramen, which has all sorts of things, almost none of which I remember (pork and corn and.. stuff) and others split a veggie ramen with extra noodles. The bowls were big enough to swim in, especially if you are a very small, champion-broth swimmer person. 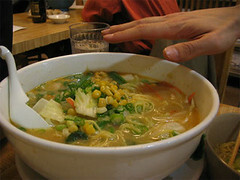 Look at the not-small hand which seems to be conjuring ramen by miso magic. Dwarfed by bowl! It's created a monster! 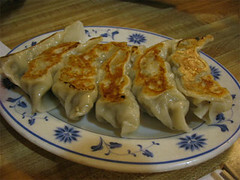 But these fried gyoza were fantabulous. The way to my heart, in more ways than one, is fried foods. They tasted like my mom's, which is very high praise. Cuz you know korean moms are the best cooks, a label which they like to play with by force-feeding you delicious feasts and then commenting on how fat you are. How cutting-edge!!! Ooh! Ramen! I'm having an asian-themed lunch this weekend at my house, as I am the only azn in my region. I might just serve ramen... but I think that would be a tad disappointing.